We are all familiar with peanut brittle, the delicious sweet and salty treat with a satisfying crunch. But this confection shouldn't be limited to just peanuts. Buttery cashew brittle is made with sugar, corn syrup, and cashews, which make it even more special. Cashew brittle is always welcome but is especially nice to have on hand for holiday guests and visiting family. Line two baking sheets with foil; generously butter the foil. Butter the sides of a large saucepan. Add the sugar, corn syrup, and water. Cook over medium heat, stirring, until sugar dissolves. Bring the sugar mixture to a boil. Blend in 1 cup of butter. Begin to stir more frequently when syrup reaches the thread stage, about 230 F.
When the temperature reaches 280 F (or soft-crack stage), add the cashews. Stir constantly until hard-crack stage, 300 F, is reached. Remove the pan from the heat and quickly stir in baking soda. Mix well. Pour onto the prepared baking pans. As the candy cools, stretch it out thinner by lifting and pulling at edges with forks. Loosen from the pans as soon as possible and turn over. Break up hardened candy and store in an airtight container. 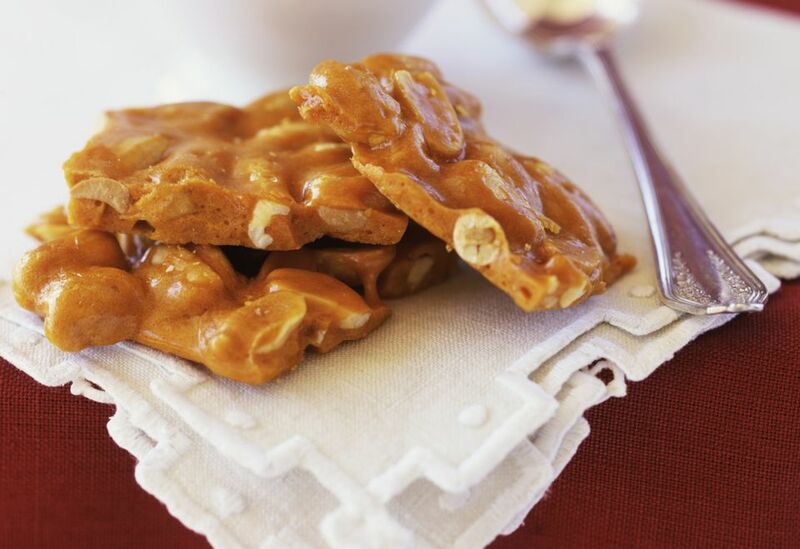 If this cashew brittle was a big hit and you'd like to try other similar recipes, there are several to choose from, whether traditional or a bit more unique. For a classic, make an old-fashioned peanut brittle, which is basically this recipe but with roasted peanuts. For something slightly different, peanut brittle with honey roasted peanuts adds another dimension of flavor and texture with the addition of vanilla and a topping of crushed peanuts, while pistachio nut brittle is perfect for fans of this rich and buttery green nut. Creamy pralines with toasted pecans​​ is a similar recipe but with milk and cream added, making for an even more decadent confection. And if you really love that juxtaposition of sugar and salt, a pretzel toffee​​ will become a new favorite, combining pretzels with peanuts, toffee, and chocolate. When making different types of confections—from fudge to taffy—the sugar and water mixture needs to be cooked to particular temperatures. These are called stages and range from the thread stage to the hard crack stage (caramelize follows the hard crack stage). At each stage, the ingredients have a particular appearance and behave a certain way. It is best to understand each candy making stage before you begin cooking.